I want Avery to be nice. I want her to be kind to everyone she meets, respect people, show compassion and have empathy for those around her. I want her to stand up for kids who are being picked on or bullied. I want her to share, to give, to help, to care. In a world that is often cruel and cold, I want her to be nice. I’m not perfect. I say mean things, I’m not always as generous as I could be. I don’t always do the right thing. I can be selfish, and I can be nasty. I fully admit that, but, I try. Some situations are harder than others, sometimes it takes everything I have to be nice. But, I do try. I just hope that I am teaching Avery to be nice! This weekend at the Cranberry Harvest Celebration we met Dina Creiger, Founder of Choose To Be Nice. We’ve all seen stories of bullying in the news, and unfortunately many of us have experienced it personally or have a child who has experienced it. Dina was a victim of bullying as a young child, and for years she had thought about starting a foundation that would inspire young people to spread kindness. 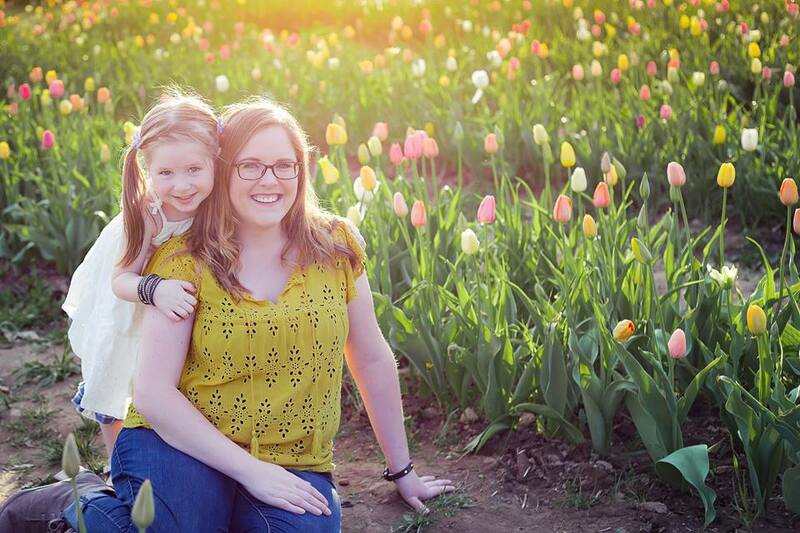 After the Boston Marathon Bombings she knew she needed to move forward. The world needed more kindness and love! The Choose To Be Nice mission is simple: Inspire, promote and encourage kindness whenever and wherever possible. Their goal is to find a million people who want to make the world a better place and to help spread their message. Choose To Be Nice partners with schools and local non-profits, like The Tomorrow Fund and Habitat for Humanity to help raise funds for those groups! It’s a wonderful way to spread their message and help give back to the community at the same time! 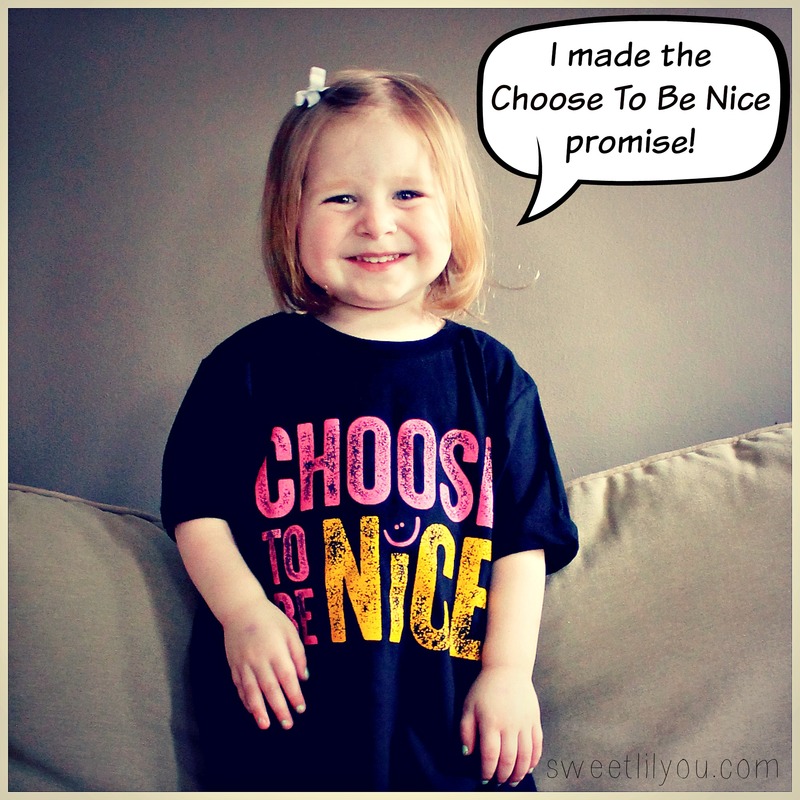 By making the promise and purchasing (and wearing) your Choose To Be Nice shirt you helping to spread the message, and also helping benefit your community! Avery, Dave and I have made the promise and you can, too! You can buy your own Choose To Be Nice apparel HERE. The Choose To Be Nice promise isn’t about being perfect, it’s about trying your best to be nice. Send a card or a real handwritten letter to a friend or loved one, just because. Donate clothes, books or toys to a local shelter or other organization. Volunteer! See if your local animal shelter, senior center, homeless shelter, etc. is looking for volunteers! Call someone just to say you’re thinking of them! Compliment people! Tell them you like their shirt, or that you are proud of an accomplishment. If you receive great service at a store or restaurant, make sure to let the manager know! We often tell management when we’re unhappy, but we should let them know about great service as well! Visit a senior center or nursing home. Take time to listen to people, like, really listen. Use your talents and skills to help someone in need. Maybe you are great at fixing things, help a neighbor or friend with work they need done. Give. Give Blood, give money, give of your time. Just give. Read to someone. Read to your child, or someone else who can’t read for whatever reason. Children can read to younger siblings, or younger friends. Stand up for someone who is being picked on or bullied! THINK before you speak! T – is it True? H – is it Helpful? I – is it Inspiring? N – is it Necessary? K – is it Kind? Make cards for soldiers overseas, nursing home residents or children in the hospital. Forgive someone who has hurt you, and ask for forgiveness from those you have hurt. If you see someone sitting alone at lunch, or on the playground, go over, say Hello, and ask them if they’d like company. Express gratitude to those who have been kind to you. Leave small gifts, or notes for people to find. Try to be understanding of a friend’s situation. Compassion and empathy go a long way. Be sensitive. Not everyone has the things you have. Smile and say Hello to people you encounter! What would you add to this list? What have you done to show kindness to others? I hope all of our readers here will make the Choose To Be Nice Promise! Together, we can change the world!! This entry was posted in Charity, Family Fun, Uncategorized and tagged choose to be nice, kindness, love, nice, non-profit, pay it forward. Love these ideas! It’s so easy to lose track of just being nice when we don’t slow down and practice the skill! Also… LOVE the hoodie! I think I need to wear it all winter as a personal and public reminder! Thank you! I know, I LOVE the hoodie as well! Both colors are gorgeous in person. Definitely on my Christmas list!! To whom it may concern, i just received my shirts from you, and the hoodie, is a little too snug, what is your return policy om anu item? You’d need to contact the company directly. I am not affiliated with them. Thanks!